We have this super huge ginormous sofa that Mr. HelloYarn, Shambles and I pile into every evening to watch a movie and knit (me) and play on the computer (him). I say “into” because it’s like a bed. This new super gigantic couch demands a bigger blanket than what we are currently using, so I promptly started one. It’s about 3 feet square now, and almost starting to look like something. I’ve got a lot more knitting time now, so it should go a bit faster than 2 months = 3 feet. I have 10 skeins each of 2 colors- 165 and a colorway so old I can’t find an example of it online. The dark green unknown colorway had a short life as my second ever sweater. That sweater was knit before I learned that wrapping the yarn around the needle in the same direction for both knits and purls made a biased fabric. The zipper in this Kureyon sweater went from the neck to where the side seam should be, so, after a brief mourning period, it became balls of yarn again. It stayed that way for years since it’s not the prettiest colorway, but mixed with the bold 165, it’s pretty zingy, which is just what the big brown couch needs. Both bags were dirt cheap and it’s satisfying to think of using them all up in this one project and therefore creating some STASH SPACE! You know, that I can then fill with something else. I feel the love for this blanket already. Isn’t it just the greatest how Kureyon does all the work? I just love how Flickr gives me the heads-up on what you’re up to before it appears here. Thanks for the color jolt! Mmmm, Noro! The blanket will be gorgeous! I was also watching the photos come in on Flickr and was just dazzled by the colors. I love how the simplest projects with this yarn are the most beautiful. 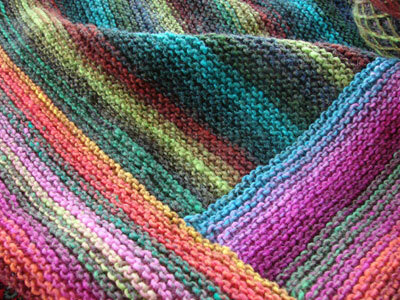 It does indeed do all the work – except for the knitting of 20 skeins into a huge blanket! The colors are amazing. The blanket will be absolutely stunning. I can’t wait for the finished product. Noro has the best and sometimes most unexpected color combinations. What an incredible blanket! Pretty! 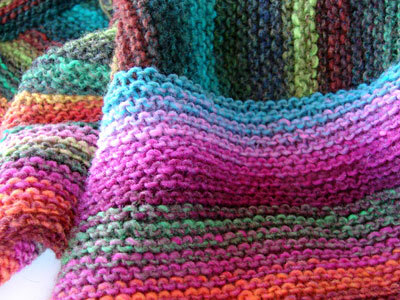 Where do you find dirt cheap bags of Noro? I had very little luck with the “dirt cheap” part on ebay last summer. Wow. All those colors!! It’s fantastic already! well you know of my love for kureyon already. i really like the green. Oh how I love Kureyon! That blanket is going to show it at it’s finest for sure!! I love Noro Kureyon. Recently made the Kureyon scarf you blogged about- love how the colors do all of the work. The blanket is awesome. Oh… what a nice gift to yourself! it’s so beautiful! great use of Noro. You come up with the best projects. Wow! 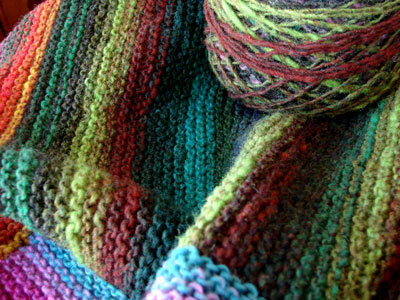 It’s such a great pairing: log cabin and Noro! I really love it. So pretty! And it just LOOKS warm! Oh awesome. I can’t wait to watch your progress. I should just send you a grammy afghan. But then her blankets aren’t super huge. Oh, thats gonna be fabulous. Love that mystery colorway. 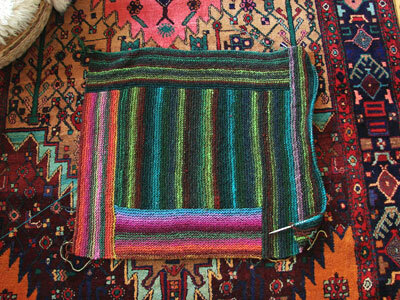 I’m so jealous of all the noro afghans out there. I live in a household that is far too accident prone for a handwash afghan. Just lovely. Watching the colours change will make knitting it so much fun. Wow! That’s going to be gorgeous! This is going to be a fantastic blanket!! 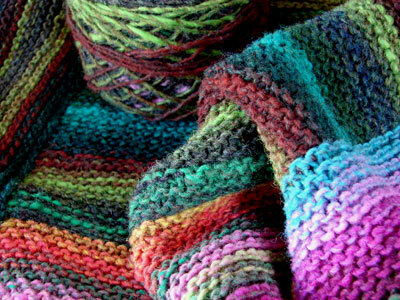 I just love the Noro yarns and Kuryeon colors. we have a huge cushy couch like that too that the hubby, I and the 3 dogs pile into every night (isn’t that the best???) – we have actually 4 blankets we use (none knitted, but all soft and cozy) – one for me, one for hubby, one for Otis (my always cold dog) and one that goes under Ravin as he sheds like crazy! OOOOOh, pretty blanket. And it will be so very, very cozy. After making lots of blankets for others, I need to decide on how to make one for us. You have a great idea and great implementation. That’s gorgeous! 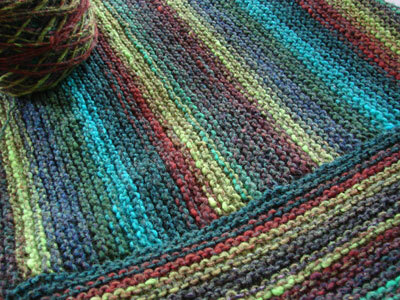 It’s actually the first time I like something knit with Noro yarn. I think Noro with its colours and shades must be one of the most perfect yarns to use for a blanket – and yours is particularly beautiful, it’s going to be so amazingly cozy! Fantastic work!